What can I beemind with Habitica? 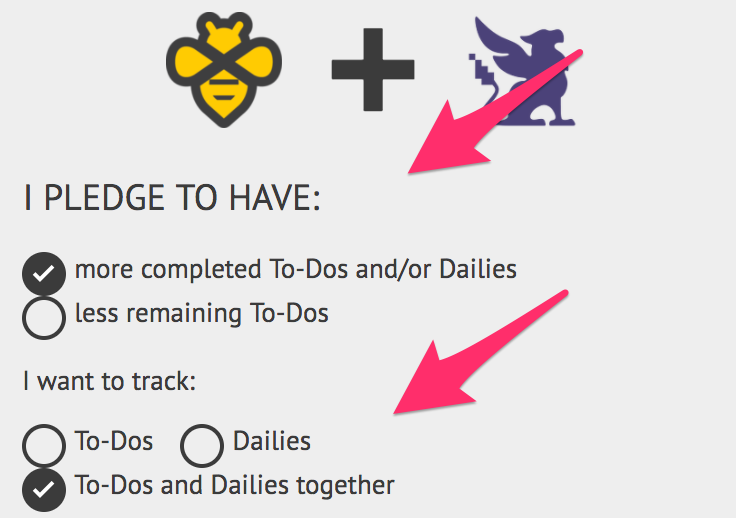 Beeminder can fetch info about your to-dos and your dailies. You can set a goal to increase them (i.e. complete more todos) or decrease them (i.e. reduce number of undone to-dos). 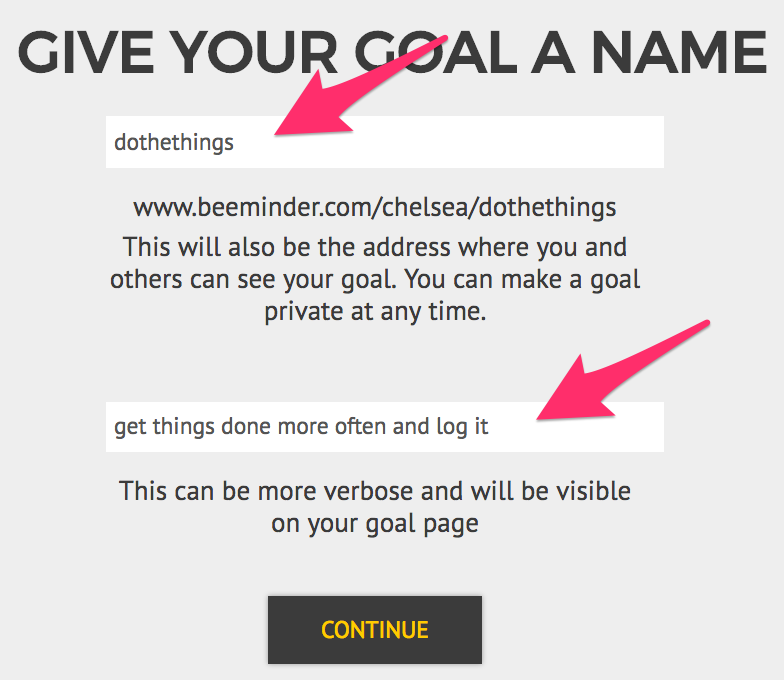 Why isn't Beeminder recognizing to-dos that I'm completing? Beeminder ignores all to-dos that are part of a challenge. The challenge owner can change or remove them at any time, which may derail your goal without your consent! We chose to limit it to your own to-dos so that you have complete control over the data that Beeminder fetches for your goal. Why is Beeminder giving my completed daily a 0 value? 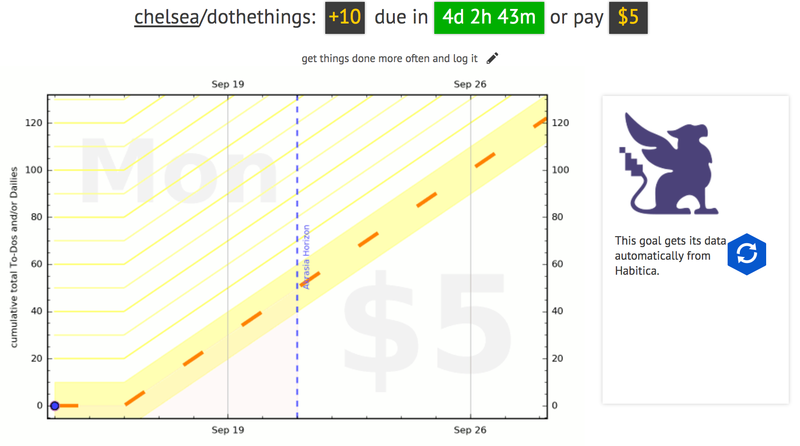 Beeminder Habitica goals have midnight deadlines, so your Dailies need to be marked finished by then in order for Beeminder to recognize them as completed on that day. If you're using Habitica's Record Yesterday's Activity feature to mark a daily as completed, Beeminder will give it a 0 value. RYA is a useful tool in Habitica, but it's not something that Beeminder has any way of hooking into, so we can't fetch the data after-the-fact! If you mark all your tasks complete in Habitica before the day ends, you can avoid this problem. But if it happens to you, that's still not a legit derailment (since you actually did the work), so contact support and we'll get it fixed for you! Click the Habitica icon to start a new goal using Habitica data. First, decide whether you want to do more things, or reduce your number of undone things. The first option is more standard — you would only use the second if you have a large backlog of undone todos that you'd like to start completing. Then pick whether you want to track To-Dos, Dailies, or both. Then, decide the rate at which you want to complete those items. You can also choose to track only items with a specific tag; by default, we'll track everything. 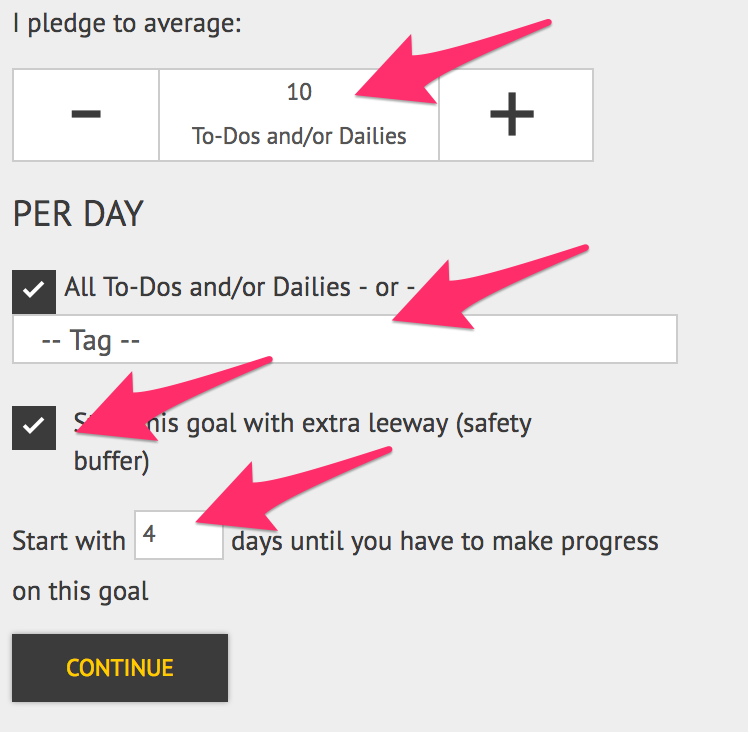 And lastly, if you want to delay your goal's start a few days (maybe you're traveling this weekend), be sure to tick the Start this goal with extra leeway box. Enter the number of days you want to delay and press Continue. And that's it! I'll need to start checking off tasks in Habitica in the next 4 days to avoid paying Beeminder my first $5.